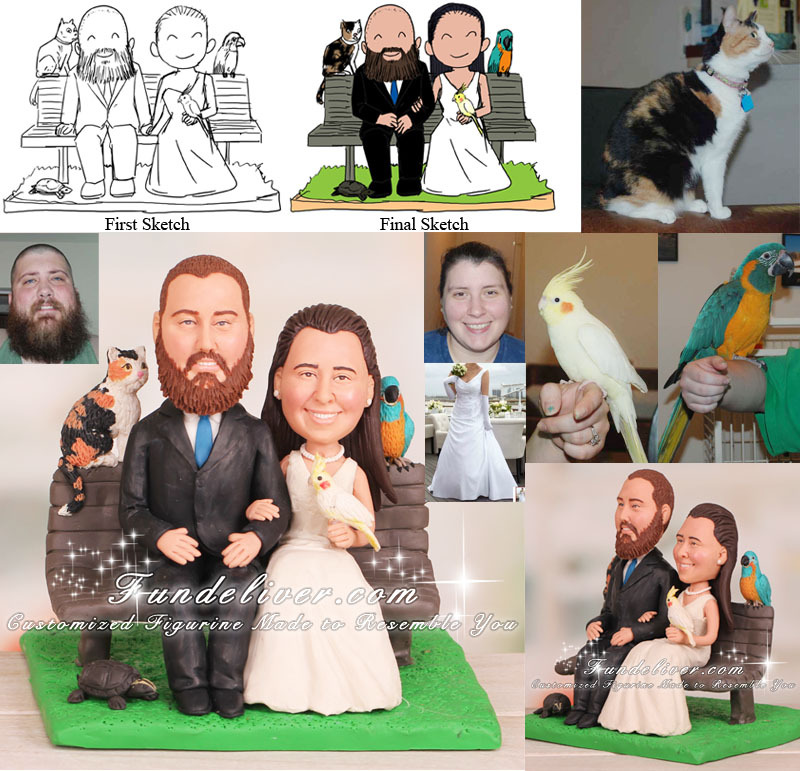 This is a completely customized couple sitting on park bench with 4 pets animal lovers wedding cake topper ordered by one of our customers. Joe and I have been dating since high school (12 years by the time of the wedding), and we have managed to survive through several years of long distance. When Joe decided to propose to me, we were going for a walk at one of the parks near out apartment. We sat down on a park bench and begin talking about what we wanted to do in the future. At which point Joe reach into his pocket and ask me to marry him. It was such a relaxed and wonderful moment in my life. There were tears and giggling. Joe and I are big time animal lovers, and our apartment is already a small rescue. Everyone who knows us, knows about our animals. We are always working with them, and playing with them. My idea for our cake topper incorporates both the proposal environment, and our animals. 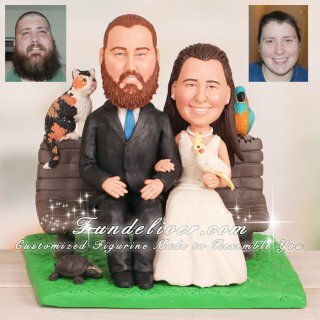 I would like a cake topper design with Joe and I sitting side by side on a park bench. We would also like to incorporate 4 of our pets. Our three legged cat Kiki, could be sitting on the park bench beside us. She is a sweet cat, and incredibly timid. She lost her right front leg due to an incident with a much larger and territorial cat. Deta, is a cockatiel Joe and I have adopted from a bird sanctuary I volunteer at in my spare time. He is very energetic, and is always singing. I would like him to be sitting on my hand instead of my holding a bouquet. Adelle is a blue throated macaw. She is a very rare bird. They are critically endangered in the wild, and are very hard to find in the pet trade. This makes it all the more sad that I can across her as a rescue. She was abused and neglected by her previously 4 owners, and was aggressive towards people. It took some work, but now she is happy and never wants to leave my side. She is still shy around new people, but she is getting more friendly every day. She could be perched on the back of the park bench. The last animal is Snappy, a turtle my fiance has had since he was a little boy. Snappy lives up to his name and is not a friendly turtle, but Joe loves him. He has his own aquarium all to himself, and he is spoiled rotten. (Actually all of our pets are spoiled) If possible please have Snappy crawling up Joe's shoe. I think this cake topper would be perfect since it expresses a beautiful moment in our life that we wish to share with everyone. It also shows our love for each other, and the "children" we have adopted through the years.